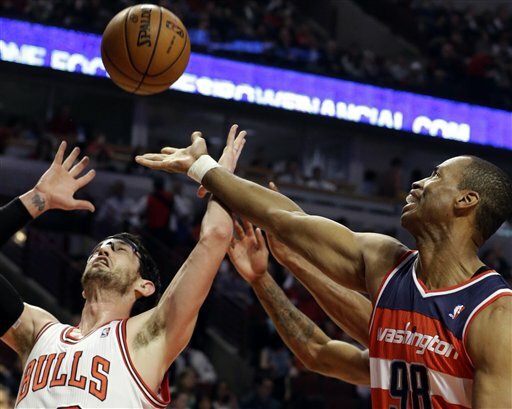 File: In this April 17, 2013 file photo, Washington Wizards center Jason Collins, right, battles for a rebound against Chicago Bulls guard Kirk Hinrich. Collins is the first male professional athlete in the major four American sports leagues to come out as gay. When I was in 20s, my queer friends and I had a phone tree. One of the most fun excuses to call was when a gay character would pop on TV. These were like rare birds or comets. There was a certain delight in seeing them, even when they were terribly written or acted, or when their ultimate effect was negative. For us, who rarely saw ourselves reflected in the flickering light of media ordinariness, seeing another member of our species in almost any circumstance was an affirmation that we existed, that we were, in fact, everywhere, however covertly. I was thinking about those times again after reading Jason Collins’ moving coming out story in Sports Illustrated. We live at a time when queer people have never been more ubiquitous in media and out in the world. However unequal we may in fact be, we’ve never been more equal. But Collins&apos; description of life in the NBA closet harkened back to a darker and lonelier time, a time when the stakes of being found out could be life-altering and devastating. It reminded me too of those years when Martina Navratilova ruled the tennis world and we – gaggles of lesbians, including many like myself who weren’t particularly interested in tennis – would flock to see her perform. Why did we go? Because one of us had reached a pinnacle, because it was important to support her. Especially important since Navratilova, one of the very first pro athletes ever to come out, was hounded by the media and actually brought to tears by the relentlessness inquisition and barbs. That particular episode made a hero of her friend and rival, Chris Evert, the tennis golden girl she stole the crown from. Evert admonished everybody to leave her friend alone. Evert demonstrated the importance of allies with words, but there was something more significant in her actions: She draped her arm around Martina and showed queerness didn’t rub off. And we, the gay gals in the stands, understood something else was at play too. With every inch that Martina won for herself, she was advancing the cause of tolerance. And every time Evert draped that arm over her shoulder, it was less extraordinary, less brave – precisely because it had been so brave that first time – and more and more a common sight at countless Grand Slams. It was weird not to see them together, so much had they become the norm. And, sure, because Martina was such a towering figure – because she reshaped and redefined women’s tennis – she was indisputable. Navratilova wrote an accompanying piece to Collins’ in which she makes an important point: hers was an individual sport. She was either good enough or she wasn’t. No one could keep her off the court but herself. With Collins, in a team sport in which personnel decisions aren’t made by players, a prejudiced coach or owner could keep a player off the court. Jason Collins’ position was more precarious. And yet Collins, deep in the closet, felt compelled to reach out with symbolic identification, a move so covert I’m not sure anyone outside his most immediate circle understood it. He wore 98 on his uniform, in honor of 1998, the year Matthew Shepard, a young gay man was murdered in horrific and inhumane fashion. That may seem an odd choice for identification. Collins is a titan, Shepard like a baby bird. But it may say something about how vulnerable Collins has felt all his life. And, of course, what an incredibly important step his coming out is. And how important all the media, league and political support is. It&apos;s Chris Evert’s arm multiplied by thousands. When I read through the reactions to Collins’ announcement and see the inevitable reader comment suggesting the revelation of sexual orientation shouldn’t be news, I agree. But until there are no Matthew Shepards, saying you’re anything but heteronormative is still an act of courage. And the fact that Jason Collins – roommates with a Kennedy, earning more than $1 million a year, and possessing the physical powers to dispatch any street bully – was still afraid, means that, yes, it’s still news.